By applecupcake on February 2nd, 2011 . Filed under: Announcements . Simply Cupcakes of Naples started as an online cupcake store four years ago, taking orders online and delivering cupcakes to Naples, Florida residents. Two years ago, the first store was opened and now a second store is being opened on Marco Island. They have over 9500 Facebook fans. Simply Cupcakes is considered the premier cupcake store in Southwest Florida and they also supply cupcakes to Nordstrom’s and ship bundt cakes worldwide. Simply Cupcakes offers 28 cupcake selections in gourmet size and minis. They are booked for at least one cupcake wedding a week through April and are in the process of hiring their 5th baker. 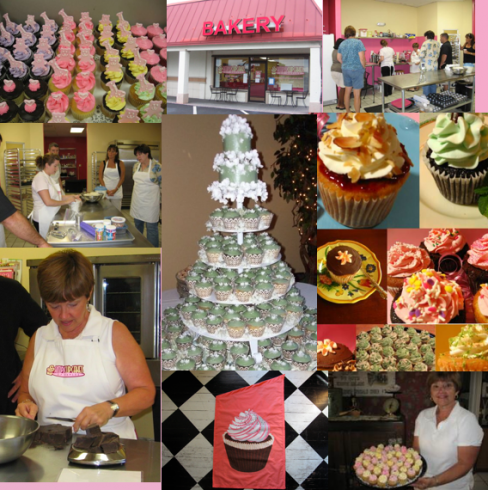 In addition to being a very successful cupcake store, Simply Cupcakes offers training for people who want to open their own cupcake business; either storefront or online. In a little over a year, they have trained people in 25 locations from California to Puerto Rico. The training is either ‘hands on’ in Naples or through a Distance Learning Program. It includes the very popular recipes, a license to use the Simply Cupcakes name, an exclusive territory with only on Simply Cupcakes in a county, a logo, a website, marketing, recommended suppliers and ongoing support. The ‘hands on’ training sessions are only done four times a year with the next one March 19-21 but the Distance Learning Training can be started any time. Details can be found here. This is a sponsored post by Simply Cupcakes. I have seen this but I didn’t understand how you can still do a cupcake online store when you are using your home for the baking when most states don’t allow that… how does this work with that in mind? As a past attendee of their training. That is one of the ways of luring you in. As far as support you get none. Ken always acts like it is a pain to answer a question for you. Joann is a sweet lady but all she does is bake and not too much of the business side. If you check out their Facebook page all you read in Ken making sarcastic remarks about how county enforcement took a sign from them and makes other tacky remarks that are in my opinion unprofessional. They really make their story seem like a rags to riches story but in all actuality they are very wealthy and own a yacht. Now to answer the million dollar question of how to open an online bakery and not bake from home. They recommend you go and find a business, church, or some other place with a commercial kitchen that you can either rent or barter cupcakes for. The price for attending has progressively gotten higher and their distant learning is a crock. All you are really getting from that are recipes which are all taken for Martha Stewart books and other known cupcake books. As for the 9500 fans. He pays for advertising on Facebook and 9,000 of the fans I guarantee you have never even tried a cupcake from there. Hate to be the bearer of ban news but Caveat Emptor (Buyer Beware)!!! You do still have to get a tax license and register your name. You will have to still go through your environmental health department for an inspection of the facility that you are using. Depending state to state, county to county, city to city. It can be easy or a long drawn out process. Just depends. In my experience if the kitchen is already inspected they will normally just pull the previous inspection they did on the place. However I know of others that it was more complicated. You may need to have the owner of the business you are using sign a commissary agreement that says you can use their kitchen. Brilliant finding this awesome website! I just wanted to if you are trying to help someone fond a house in Naples Florida, I will be thrilled to assist you and if you’re a licensed Real Estate agent, I’ll even offer a referral fee if the deal goes through. Wishing you and your family a Happy and prosperous 2011 New Year! I would possibly be interested in attending your training program, but wonder if you offer a price for training only? I would not require the hotel or meals at this time.